This is a beautiful and unusual figural flower frog (flower arranger) shaped like a deer! 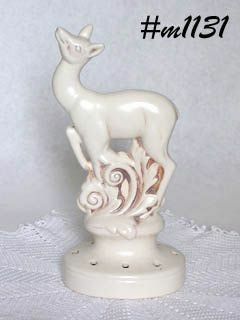 In the center of the round base of the flower arranger is a large deer with "foliage" at its feet. It measures 10" tall (at tallest) and is a soft white/creamy color with tan accent color. This is a substantial size flower arranger (at 10") and it's in excellent condition! There are no dings, no chips, no cracks, and only minor crazing on the base -- that's it! !